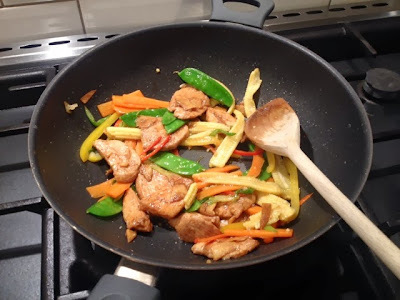 A Chinese style stir fry is something I make quite regularly at home, whether it be with chicken, beef or fish, but I most often make egg fried rice to go with it or cut out the carbs altogether and just have loads of veggies. 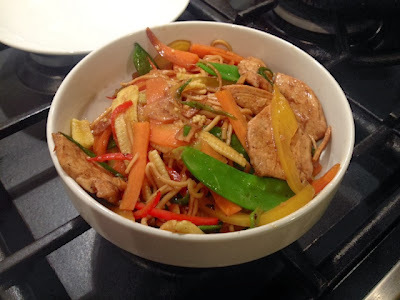 A few weeks ago when The Boyfriend was trying to come up with a few quick recipe ideas, as with an intensive uni course and multiple sports clubs he doesn’t have much time to cook, he tried to make a chow mein and it wasn’t a great success so I began to consider using what I know about stir frying to recreate this popular Chinese dish you might find on your local takeaway menu. 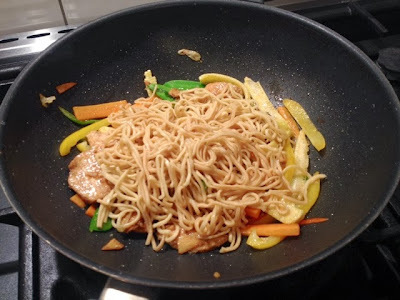 I tried doing a really basic chow mein from the ingredients he had in his fridge (which wasn’t a lot) a few weeks ago and almost got there but thought I could do better and decided to put it on the to do list to get my perfect chow mein right. 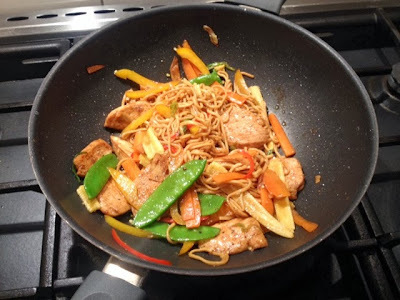 As I was trying to make this recipe as simple and student friendly as possible at first I tried using those packs of stir fry veg you can buy in the supermarket. These are ok if you’re really strapped for time, but I do think it’s worth getting your own veg and taking 2 minutes to chop them up as they have a better crunch and variety of flavour, it makes a significant difference. 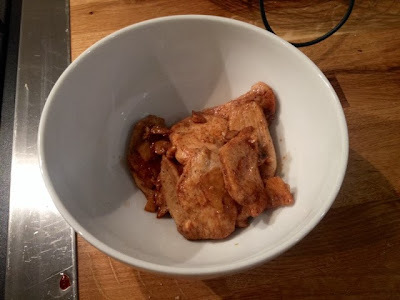 Also I have said here to leave the chicken to marinate for a couple of hours, but if you are in a hurry this isn’t absolutely necessary, you can just mix up the chicken with the marinade and start cooking straight away. Fresh egg noodles are nice but I find the dried variety much more convenient and they also tend to come in handy portion sizes so you can use one ‘nest’ per person which saves any waste and they won’t go off in your cupboard. 1. 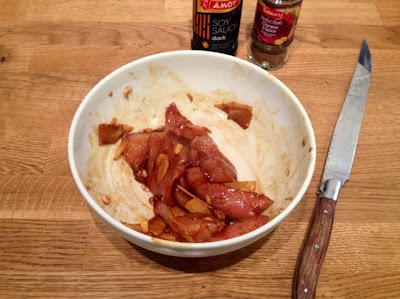 Marinate the chicken in about 2 tbsps of the soy sauce and mix in the ginger and garlic. Cover and leave to marinate in the fridge for a couple of hours. 2. Heat a little oil on a large wok and begin to fry the chicken on a medium-high heat. 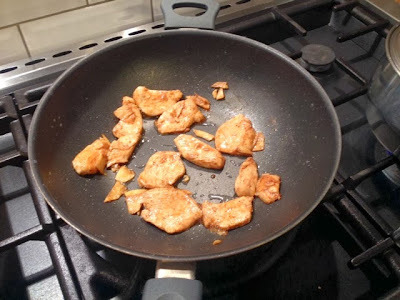 Make sure you get all of the ginger and garlic in the pan too, don’t discard them. 3. When the chicken is cooked, set aside and keep warm. 4. 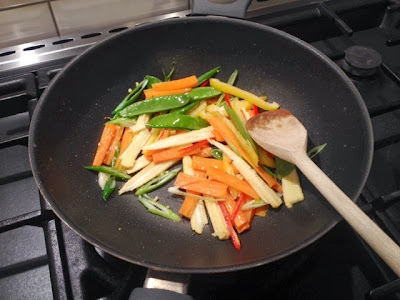 Add all of the vegetables to the pan and gently fry, keep stirring. 5. Meanwhile add the dried noodles to a pan of boiling water and cook according to packet instructions. They should take around 4 minutes. 6. When the vegetables have softened, don’t over cook them, try to keep a bit of crunch, return the chicken to the pan to heat through. 7. 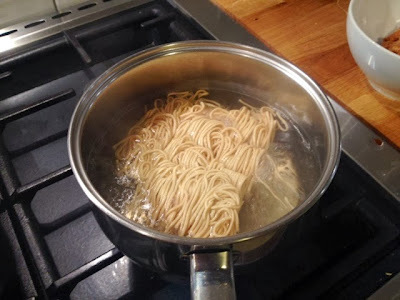 Drain the noodles and add to the pan. 8. Stir through and add a few tablespoons of soy sauce to the whole thing. 9. 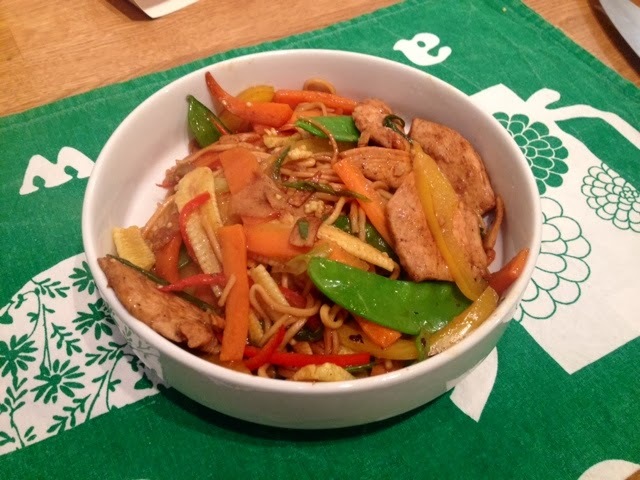 Dish up into a warm bowl for your very own much healthier, much tastier alternative to a Chinese takeaway.